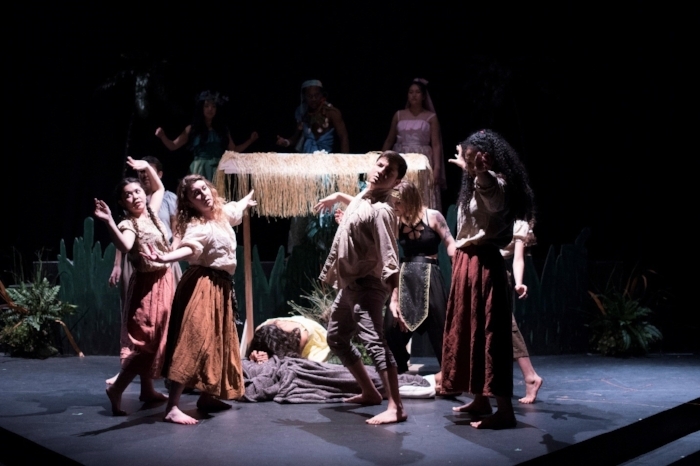 If you’re looking for a fairytale musical featuring powerful dance, emotional song, and an incredibly talented cast, “Once On This Island” at the Red Gate Revue stage is an excellent production to see! With the set and costumes as colourful, bright, and expressive as the actors, the myth-like story set in the tropical islands of the French Antilles, shares the beauty and power of love to bring people of different social classes together. It follows a young island girl, named Ti-Moune, as she journeys between the world of her people to the world of the French colonial rulers of the island. The music drives joyous rhythm with upbeat conga and full-voiced harmonies, and then tugs our heartstrings with impassioned piano melodies. The ending leaves you crying and cheering at the same time. Director Damon Bradley Jang, who also is the associate choreographer and uncredited set designer, brings together a splendid vision of emotion and colour to the musical written by the same team who brought us Seussical the Musical, Anastatia and Ragtime. Featuring a diverse and multicultural cast of young, old, and seasoned and debuting actors, Fabulist Theater's production packs immense talent onto the stage. Without a doubt, Brianna Clark (Ti-Moune) is a Disney princess and captivates the audience effortlessly. Her presence and voice make the word ethereal come to mind, as she’s entirely an out-of-this-world talent, and her performance alone makes it worth the trip. But, there are other young stars in the making, such as thirteen-year-old Arta Negahban (Little Girl/ Little Ti-Moune). Both of these young actors were expressive, articulate, and professional in a way that defies age. Ricardo Pequenino (Agwe), YooRa Kang (Asaka), Sari Rosofsky (Papa Ge) and Alexandra Quispe (Erzulie) play the gods of the island, each with their distinct roles and personalities. Each god gets their spotlight to showcase their incredible vocal prowess, and throughout the entire musical, the cast makes every song soar. The costumes (by designer Chris Sinosish) are as colourful and distinct as each actor’s embodiment of their character. Earth tones and plain representing the poor laboring peasants and white with fancy hats for the French aristocrat Grande Hommes. They are each engaging in their own way and this company works hard to keep the flow of the story moving always. The music, led by Amy Gartner is performed by a tight band which creates a vast soundscape of that sounds much bigger then they are. At times they overpower the gorgeous vocals of the singers a bit, but that is an easily fixable technical issue. The dance in this production was an integral part of the storytelling, and Marion Landers (Choreographer) has used her training in African, ballet, and contemporary dance to expose the heart of the story. The movement is raw, wild, expressive, and engaging to watch! Associate choreographer Jang brings his vast musical theatre experience to stage some visually interesting, narrative-driven numbers such as “The Sad Tale of the Beauxhommes” and “Some Say.” The space is small, and it looked like blocking at times was crammed, but as the show settles, I'm sure they will find their footing and flesh out the stage. It’s worth saying there are 15 in this production. Moving at a lighting face pace, the 90 min production whisks the audience through a magical and heart-wrenching journey worthy of the gods themselves. Overall, if you’re in the mood to be swept away by a great story, this one-act musical is just the thing to see. You can catch the show next weekend on April 12th, 13th, or 14th at the Red Gate Revue stage. Tickets available at http://OOtivan.bpt.me.